(Warning, philosophy ahead – please read this first paragraph slowly) It is a strange thing how faith changes your life. When you think about it, how could it not change your life? Hebrews 11:1 gives us a definition of faith when it tells us, “Now faith is the substance of things hoped for, the evidence of things not seen.” When you have evidence of something that you have not seen, it makes it possible to believe it exists. Without evidence, that thing is just an idea or concept, but with enough evidence it becomes established as real, or as truth, even without physically seeing it. This initial belief in the existence of something by faith then results in a change of your understanding of the things that are related to that thing. If this thing is significant enough, then over time, the way you act, feel, and think about everything else will change, as it is now filtered through this newly established truth. One day the world is believed to be flat, then there is evidence to prove it is round, and everything changes. For those who are disciples of Christ, the evidence of the claims He made is revealed to us in a real way that cannot be denied. This evidence (which comes from Jesus Himself and the Holy Spirit) gives us the ability to believe, and as the rest of our lives are then filtered through this new truth…we change. The more we are willing to act, feel, and think through the filter of our faith in Jesus, the greater our faith becomes (given, of course, because of God’s grace) and the more we as an individual change. The strange thing (that I alluded to in the very first sentence) is that this changed person of great faith is who you were really created to be…so basically you are becoming your real self. I told you it was strange (or maybe just my strange way of explaining and phrasing things). The point of this feeble attempt at a philosophy lesson was to prelude some significant events that happened around this week’s church visit. Now that I think about it, that message does not actually do a good job of leading into this story at all, but it was on my heart to share for some reason, so there you go…faith. Now on to the next paragraph. OK, so the significant events…lets just say that a new person stumbled into my life this week. I do not want to reveal personal information about this person, and I definitely do not want to betray any type of trust they may have in me, so I will keep their name and specific circumstances private. What I can share is that I met this person at a time in which they were experiencing a personal crisis. It was one of those total “God things”, because had we both not been at the exact place at the exact time, we would have never crossed paths…a few seconds would have changed everything. The consequences of not crossing paths could have meant serious injury or even death for this person. Even having crossed paths, if I had not had the faith or desire to do the things I did, the end result would have been just as tragic. Trust me…it was a God thing. Because of the way God has changed my life through faith in Him (there’s the connection I was looking for in the first paragraph), I was able to show God’s love to another human being. I was able to offer real help to a person in crisis. I had the faith to lay hands on them and pray for their needs and for their faith. I had the faith to invite them to attend church with me and Laura on Sunday, and I will have the faith to continue to love and serve this person in any way I can. These things were accomplished through faith and for the glory of God. Faith comes from God, and the awesome results of faith glorify God. So, Laura and I had been invited to attend North Point Community Church by Joe Danules, the President of the company she works for, Pathway Polymers, and his wife Mary Danules. North Point Community Church is the second largest church in the country, and is pastored by Andy Stanley. Unfortunately, the church is in Alpharetta, GA, which is a long drive from Chattanooga, but they do have a church plant called Rock Point Community Church that meets at Chattanooga Christian School. Bingo…sounds like a winner to me! So on Sunday morning, Laura and I picked up our new friend and headed over to CCS to check out Rock Point. Having a guest along with us definitely changed the dynamic of my church experience this week. I usually show up to the churches I visit early to try to engage in conversation with other people and to get a feel for the environment and explore the church a little bit. Trying to coordinate with someone else’s schedule did not really work out that way, so we basically showed up at church just as the service was beginning, and as a result we did not have a chance to socialize and experience that aspect of this congregation. We were greeted by a parking greeter, a walkway greeter, and multiple door greeters on our way from the car to the CCS auditorium, so I can say that they definitely do their part to make sure you feel welcome and know where to go. Upon entering the CCS auditorium, we blew through the lobby after receiving a bulletin from the door greeter, and headed straight into the already darkened auditorium down to the second row of seating in front of the stage. There was a skit going on that was a take-off from “Are You Smarter than a Fifth Grader?”, but since we missed most of the skit, I did not really get the point of it and all I could tell you about it was that, just like the TV show, the kid won. After the skit, the worship band came on stage and launched into the worship service with the force of a full-on rock concert. The lighting in the room was dim, there was colorful up-lighting on the stage, the music was loud, and the energy was high. The band, which consisted of keyboards, drums, bass, and multiple guitars, started with an up tempo number and then slowed the pace with two anthemic power ballads that really had Laura and me connected in a spirit of worship. Since we were in the front of the room, I could not really provide a good description for how the rest of the congregation worshiped, but I did see many people raising hands which made it at least seem like an open and expressive environment. After worship concluded there was a short time for greeting the people around us, collection of tithes and offerings, and then it was time for the sermon. Normally I would provide a more vivid description of the sanctuary and church building, but since we bypassed the lobby set-up and were in a high school auditorium, that is really all I have to say about that (like Forrest Gump). The sermon at Rock Point Community Church highlighted the one big difference between this church and all the others I have visited (ever). 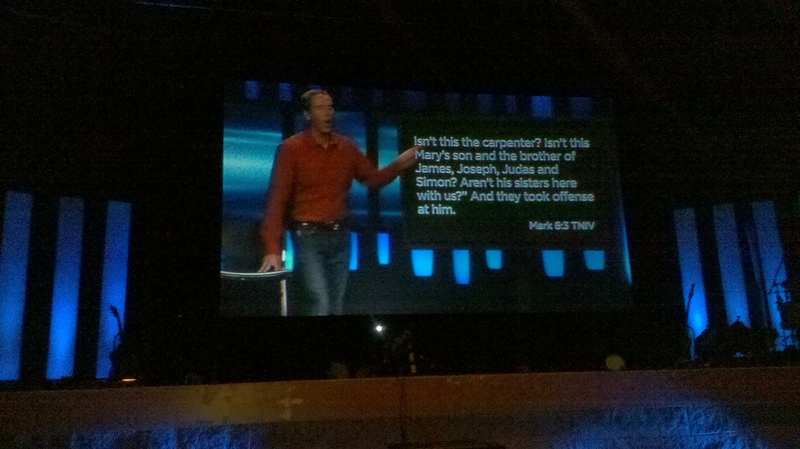 It was coming from Andy Stanley who was preaching in person at North Point Community Church in Alpharetta, but was being “beamed in” and projected on to a big screen on the stage here in Chattanooga. 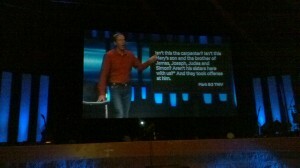 So we were actually seeing and hearing Andy Stanley live, but not in-person. At first, I was not real crazy about that idea, and started wondering if this was really what church should be like…impersonal, a projection of a man on a screen who could not hear or see me. But as Pastor Andy began his sermon on faith (oh, the timing) and I started getting wrapped up and focused on his message, the awareness of where the message was coming from diminished and the whole idea of the projector screen lost any sense of distraction it may have presented. I have never heard a sermon from Andy Stanley before and have never read any of his books (honestly I didn’t even really know who he was before this week) so I must say my first impression of him was a very positive one. He spoke fast and moved through a lot of material rather rapidly, but every point was presented very plainly and there was no struggle at all to follow along (read some thoughts on Andy Stanley on Jon Acuff’s blog, Stuff Christians Like). He opened with an overview of faith, starting with Mark 6:3 and Matthew 8:10, noting that these are the only two Biblical instances of Jesus being described as “amazed”, in one instance by great faith, and in the other instance by a lack of faith, but in both instances it was faith that caused His amazement. Pastor Andy followed up by pointing out that the evidence of great faith in us, is responding to situations in life in a way that shows we are absolutely confident that God is with us. He then ran through North Point’s (and all their church plant’s) mission as it pertains to faith, and he provided examples of different levels or “leaps” of faith that we experience in life, such as “16-year-old high school student” faith, “single and just moved to Atlanta” faith, “married and just had our first baby” faith, or “parents with a teenager” faith. In all of these faith stages of life, we are tested in different ways, leading to the question, “how do I trust God as a (insert stage of life here)? Pastor Andy then came to the main focus of his sermon, which was the “5 main things that surface in every faith story”. This week he went through the first two, which were: 1) Practical Biblical Teaching, and 2) Providential Relationships. What?!??! Are you serious? I just had this “God thing” happen in my life, running into the person in crisis, following God’s call by faith to help them and pray for them and invite them to church, and then Andy Stanley who isn’t even in the same city as me starts going over one of the main points of his sermon, which is providential relationships. God, you are truly amazing! Pastor Andy described a providential relationship as someone God uses in your life as a major “faith catalyst”. On the way out of church that morning, our new friend looks over and says to us, “that sermon made me think maybe God put you in my life for a reason”. Wow! Glory to God! How is that for evidence? The transition from Andy Stanley on the big projection screen to Powell Grisham, the lead pastor of Rock Point, who was actually standing there in person, was a little awkward…probably just because this was the first time I had experienced it. Pastor Powell closed the service with announcements and prayer, and the lights came on and we all filed out of the auditorium. My wife, Laura, gathered some informational materials from the visitors booth in the lobby on our way out, but since we had a guest with us we did not take time to stop and mingle and potentially meet some of the other church members. We had some good conversation with our new friend on the way home about providential relationships and our hope that we would continue our friendship. It is my hope that this person will continue to join us on our ChurchSurfer church visits around the Chattanooga area, and maybe transition into regular attendance at a church home, where they can continue growing in the faith as part of a faith family. I ask that everyone reading this would keep us and this person in your prayers. Their circumstances will require some tough decisions and life changes in order to truly follow Christ and not just believe. Please pray that the messengers carrying the lies of the enemy are kept at bay and that this person accepts God’s call on their heart. Pray that this person is able to clearly understand and see the evidence leading to faith that is being shown in their life and that we are all strengthened by Christ to continue sharing His love and serving others. Thank you for your prayers! If you enjoyed this article, please click the Google +1 button at the top or bottom of the page. Thank you for the kind words of encouragement Johnie, and also for the invitation! I will check out the Signal COC website for sure, and you never know when I might drop in :). Peace and blessings in Christ!